I have been talking recently to a guy who started his betting career on a serious basis a few years ago. And by serious I mean he had to live off of the money he won. He told me about the method that he used to find his value bets, which required no form study, and essentially was just comparing prices between bookmakers and Betfair. This is a method I've heard about before and I've now done a bit of research for this article. 2. If you can get better odds from a bookmaker than the Betfair odds you have value. 3. When you find such a bet you either back with the bookie and lay off at Betfair for a guaranteed profit or just back the horse with the bookie because it is a value bet and you will win in the long run. So I'm sure that has raised two questions in your mind, how profitable is it and how hard is it to find the selections. Let's start with finding the selections, basically all this requires is to scan though the cards at Oddschecker looking for horses that have a bigger bookies price than the Betfair price. Then clicking through to Betfair to see if you can lay the selection at shorter odds than the bookie price. If you can then place the bet with the bookie and either lay it or not at Betfair depending on which strategy you are using. While looking for some data to confirm that this is still a profitable strategy I came across a tool that will find the bets for you and this tool has a results page showing results going back three years. Here's a screenshot for 2012. You can click here to get the full breakdown on Bet Synergy. If you've used this method, this software or anything similar do let me know in the comments. Today we've got a big priced selection from Mark Foley which is worth a small interest and a bet from the Chase Specialist. But first an appeal for information. I got an email yesterday from somebody raving about some amazing software that apparently has made over £50,000 this year. The software is called Bet Synergy, if you are using it or have used it I'd love to hear your thoughts on it, please email me or add a comment below, thanks. Made a winning debut for Richard Hannon at Newbury last summer; hasn´t progressed though and well held both starts for current stable (pulled too hard on heavy ground last time); dropping down the weights and hood tried but still risky. 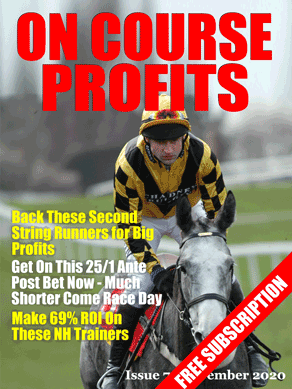 Runners aged 5 or younger in handicaps, not upped in distance and returning within 30 days.